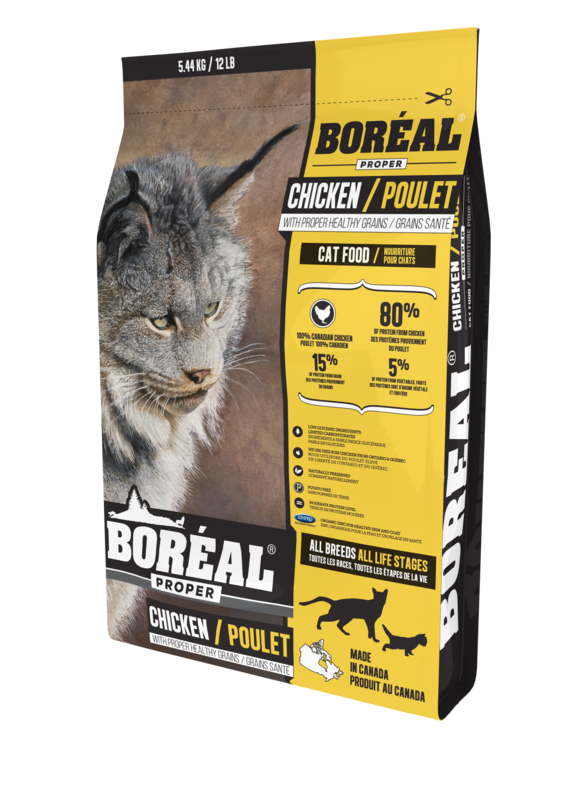 Our Boréal Original Chicken diet is a grain free food based on chicken proteins - made using fresh Ontario and Quebec chicken. 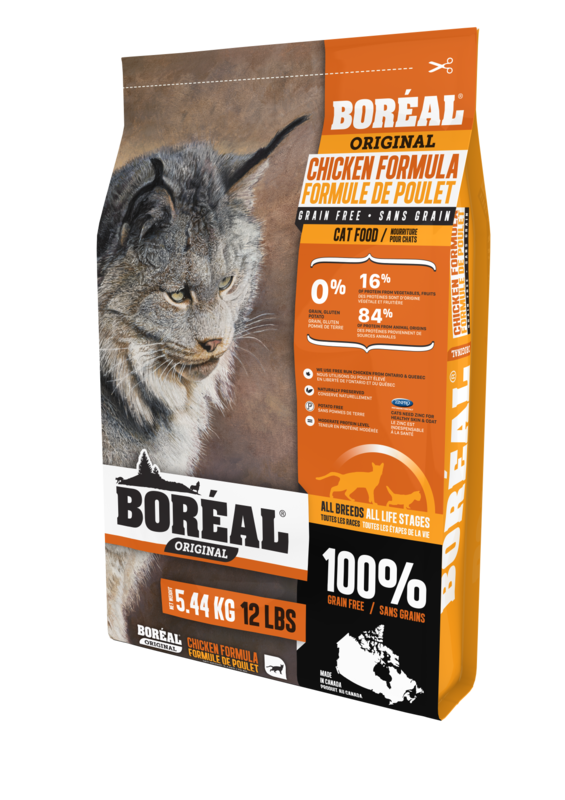 This is an everyday diet, which can be used to help keep weight off your cat and additionally can be used as a hypoallergenic formula. We use a base of beans and peas to replace the grains found in several cat foods and we also add a combination of herbal pack including blueberries and cranberries, thus improving the taste of the food in addition to added antioxidants with several health benefits. Deboned Chicken, Chicken Meal, Peas, Dried Whole Eggs, Pea Starch, Salmon Meal, Chicken & Turkey Fat (Preserved With Mixed Tocopherols), Beans, Dehydrated Alfalfa Meal, Natural Chicken Flavour, Flaxseed, Choline Chloride, Salt, Calcium Sulphate, Vitamin E Supplement, Lecithin, Zinc Amino Acid Complex, Manganese Amino Acid Complex, Iron Amino Acid Complex, Taurine, Mannanoligosaccharides, Chicory Root Extract, Apple, Carrot, Cranberry, Spinach, Tomato, Papaya, Pineapple Stems, Blueberries, Green Tea Extract, Calcium Carbonate, Ferrous Sulfate, Zinc Sulfate, Niacin, Copper Sulfate, Manganese Sulfate, Vitamin A Supplement, Thiamine Mononitrate, Calcium Pantothenate, Pyridoxine Hydrochloride, Riboflavin, Biotin, Vitamin B12 Supplement, Sodium Selenite, Vitamin D3 Supplement, Folic Acid, Calcium Iodate.